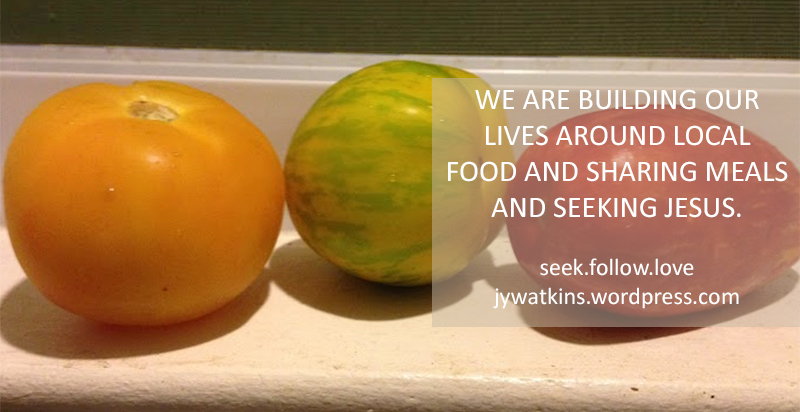 Tomatoes – seek. follow. love. When I was younger and my mom would ask me to help with dinner, one of my least favorite things to do was cut up tomatoes. Sometimes they needed to be diced for tacos, or sliced for hamburgers, or quartered for salad. But no matter what, I didn’t want to do it. Something about the mixture of the tough skin and the soft fruit, the gooey seeds and the dull knife made it miserable to me. It was a strange pet peeve for a teenage girl, but it definitely made my list. It also, obviously, stuck in my memory. This summer, Chad and I visited our local farmer’s market often. It’s held on Sundays in our town, so we would stop by after church or, if we skipped church, we’d stop by on our way to or from other errands. We’d mosey through the tents of homemade foods and local vegetables. Buying local is very trendy right now and we get it. We love it. We love supporting our local farmers and vendors. We love reducing our carbon footprint. We love the romance of strolling through the farmer’s market to get veggies for the week and lunch for that afternoon. One particular farm stand had the most beautiful tomatoes, green and yellow and red, of all different shapes and sizes. The colors enchanted us and so we couldn’t resist. We brought them home for tomato and mozzarella salad and came back a couple weeks later to get a bag full for our garden party. Beautiful, multicolored orbs, perfect for stuffed tomatoes and tomato and goat cheese croquettes. Lucky for me, Chad and I have a great set of cooking knives. We use them all the time. We even have a tomato knife. Standing in our kitchen this summer, sunlight streaming through the window above the sink, wooden cutting board and knife at the ready, cutting and slicing the tomatoes was not the chore I remembered it being. The farmer’s market fruit was soft and squishy, so the actual cutting was still a bit of a challenge, even with the best tools, but somehow I didn’t mind. Because we were cooking for our friends, who were joining us for a second year at a garden party date night in our backyard. We were prepping delicious food, with new recipes and fun ingredients. We were using food from our area that was bright and colorful and sweet. We felt connected to our neighborhood and our friends and our food. We felt grateful for all these things God had provided for us. I’m sure if I thought long enough, I could wrap this up with some great metaphor about having the right tools or the right perspective, but really, these tomatoes were just part of a lovely summer we enjoyed in our backyard, with friends and campfires, good wine and good dinners, hard work weeding and mulching, late night conversations under twinkling lights. We are building small traditions in our home like Friday night pizza, backyard garden parties, and lazy Saturday mornings with the crossword puzzle. We are building habits and routines, like meandering trips to the farmer’s market, yard work on Sundays, and dinner and rosé wine on the patio on warm summer nights. We are building our lives around local food and sharing meals and seeking Jesus, all things we believe fit very nicely together. And that’s what I know when I chop up the tomatoes now. It’s still probably not my favorite thing to do (because my goodness, the gooey seeds and the way they kinda just squish instead of actually cutting sometimes! ), but it’s part of a greater life we’re building here in our home. With our third summer in this house under our belt, I can see the patterns now and there’s something beautiful about these summer nights together, even– or maybe especially– when it’s just Chad and I with a glass of chilled wine on the patio, looking at that new patch of earth we’ve just cleared. And we thank God for this home and the people who help us fill it, for the sweat we put into the yard and the birds that make their homes in the trees, for the smell of pizza on the grill and the glitter of lights strung up from the house, for the way Olive Oil begs to come outside, for the laundry hanging on the clothesline and the campfires that remind of us childhood, for the patio furniture we built from pallet wood and the neighbors calling to their kids, for the taste of bright green, yellow, and red tomatoes and all the warmth of summer. I’ve been intending to write a post about your house. It is a retreat for us—a local oasis. 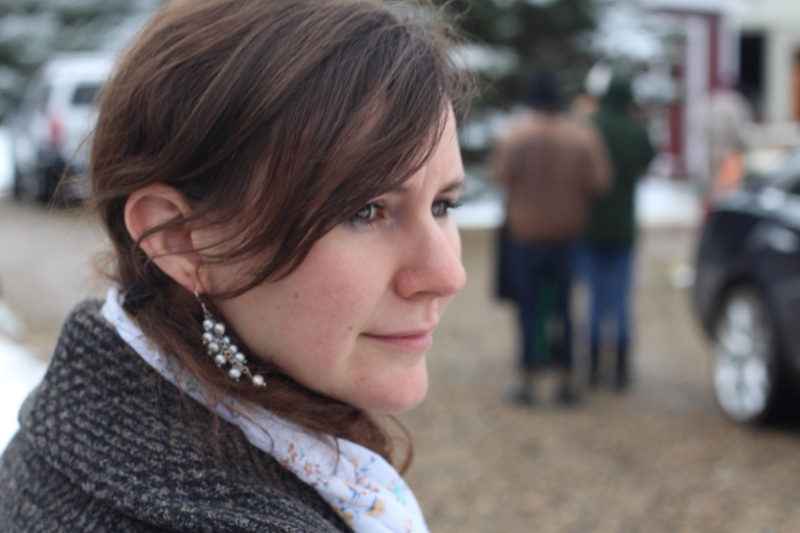 You’ve fostered a peaceful, welcoming, and loving environment…much akin to that in the early church, I believe. Thanks! That’s what we want our home to be. Beautiful, Jamie! Just beautiful. Thanks for sharing. Jamie, I love your way with words! You and Chad have the gift of hospitality. Love that you enjoy inviting people into your home.